Hitchcock returns to his film-making roots, and revisits the Jack the Ripper theme. In an extract from his forthcoming book “Fear Beyond Belief”, RICHARD PHILLIPS-JONES looks at 1972’s horror-thriller Frenzy. London, sometime in 1971. An ex-pat director making something of a homecoming would signpost many of the routes the horror film would take in the next decade or so. Alfred Hitchcock is one of the greatest influences on the modern horror film, yet it is generally perceived that he only made two films which easily fall into this category: Psycho (1960) and The Birds (1963). However, I would argue that there are two further films in his catalogue which qualify as such, both of which were made in England, both of which draw heavily on the theme of Jack the Ripper. Interestingly, the two films come from opposite ends of his career. 1927’s The Lodger would set the tone for Hitchcock’s career going forwards, but his 1972 variation on the same theme would nicely bring his career full circle. Whilst Frenzy would not be Hitchcock’s final film (the somewhat quaint Family Plot (1976) would follow), it was nonetheless the perfect epitaph to his career. As Italian film makers (spearheaded by Dario Argento) took Hitchcock’s trademark touches by the horns and produced a plethora of stylish Giallo pictures, Frenzy seems almost like a reaction by Hitchcock to this imitation/flattery. How much Hitchcock had seen of Argento’s early work is debatable, but it is more than feasible that he had seen The Bird With The Crystal Plumage in his private screening room on the Universal lot. After all, Hitchcock was not just a maker of films but a voracious viewer, all the way back to a film society he had formed with fellow directors in London in the 1920’s. Based upon the book Goodbye Piccadilly, Farewell Leicester Square by Arthur La Bern, the screenplay by Anthony Schaffer transposes the action from its original post-World War II setting to contemporary London, whilst also transposing many elements of Hitchcock’s 1927 film – it is fascinating to compare the opening shots of the two films, both of which feature crowds of onlookers witnessing a murder victim’s corpse being washed up on the banks of the Thames. 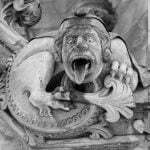 Unlike the earlier film, the audience is made aware quite quickly that the murderer is the charismatic Robert Rusk (Barry Foster), who brutally rapes his victims before strangling them with his tie. However, the police suspect his friend Richard Blaney (Jon Finch), who finds himself on the run. It’s a favourite theme of Hitchcock: the wrong man being implicated by a police presence which seems somewhat incompetent. The theme is given something of a twist on this occasion, since Blaney is not an easy character to root for: a sullen, bitter man, given to sudden outbursts of rage. Rusk, by complete contrast is charm personified, and all too happy to fuel the police’s incorrect assumptions. An unnerving undercurrent is added to the audience experience by the knowledge that, were you to meet these two people for the first time with no prior knowledge of their activities, the vicious murderer would likely be the one you would warm to. The performances by both Foster and Finch are pitch perfect, amongst the finest in Hitchcock’s body of work. Frenzy is perhaps the director’s most visceral work. The scene in which Rusk attacks and murders Blaney’s ex-wife Brenda (Barbara Leigh-Hunt, who acts this most horrific of scenes with underplayed dignity) remains gruelling to watch all these years later. By contrast, Hitchcock has the good sense to cut away from Rusk’s next murder. Rightly sensing that the audience has already seen what Rusk is capable of and is therefore capable of filling in the details themselves, he leaves them to do just that as he pans away from the room where the murder is taking place, and a long crane shot (actually two shots, seamlessly joined) pulls the viewer down the stairs, out the front door and back onto the busy street, where people continue on their business, unaware of what is happening in the room upstairs. And yet, the film is teeming with humour, albeit of the darkest variety. A sequence in which Rusk is desperately trying to discard of a victim’s body, remembers his tie-pin is clutched in her stiffened hand, and then ends up trying to retrieve it on the back of a potato lorry headed north will have you guiltily sniggering at Rusk’s pathetic and frantic actions. It’s not that we sympathise with him by any means, but we’ve all had moments when a job has gone wrong or we’ve tried to cover up a mistake – that’s the part we empathise and identify with. Further comic relief comes in the form of the home life of main investigating officer, Chief Inspector Oxford (Alec McCowen), and the failed attempts of his wife (Vivien Merchant) at gourmet cookery. Whilst some have criticised these scenes as irrelevant, I think they provide some welcome respite from a story arc in which it becomes increasingly inferred that the wrong man is on his way to being convicted. Other fine actors play their part in proceedings: Anna Massey is Babs, Blaney’s co-worker in a pub who becomes his girlfriend, and may be making an error in taking up Rusk’s offer of a room for the night. Clive Swift is Blaney’s ex-RAF chum Johnny Porter, who’s willing to help an old friend but is actively discouraged by his wife Hetty (Billie Whitelaw). The film is perhaps also a reaction by Hitchcock to criticism of his previous two films (Torn Curtain (1966) and Topaz (1969)), and accusations that he was out of touch with modern audiences. Whatever the motivation, the director turned in a film which demonstrated that, not only was he still fully in touch but he was arguably a good few years ahead of his time. Frenzy is not only that rarest of creatures, a British Giallo. It’s also an unsung horror/thriller gem. After pulling the audience’s nerves to breaking point in a way that only he can do, Hitchcock delivers a surprisingly low-key conclusion which is nonetheless satisfying and somehow perfect. 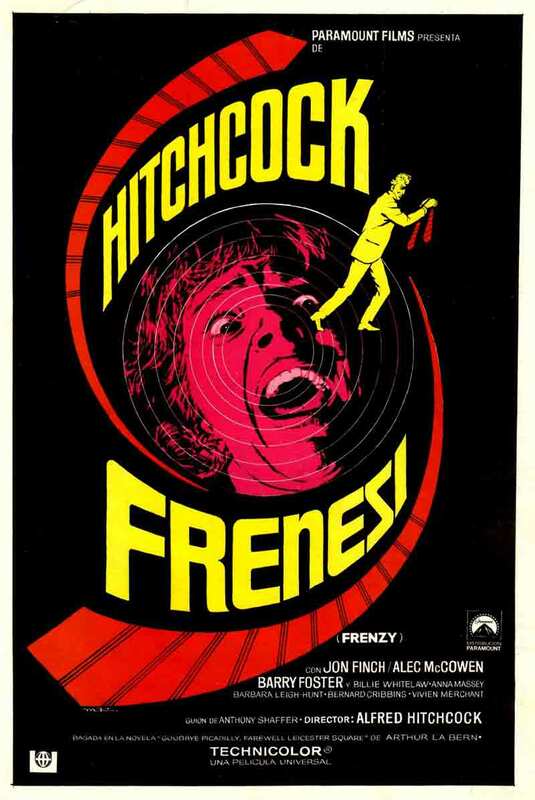 For me, brilliant though his other works are (and despite very stiff competition from 1958’s Vertigo), Frenzy is in many ways the quintessential Hitchcock thriller and my personal favourite. Fantastic review … I watched Frenzy tonight and Richard’s review is spot on… one of Hitchcock’s best! Fantastic review … I watched Frenzy tonight and Richard’s review is spot on… one of Alfred Hitchcock’s best!